Fantastic home sitting on just under 1 AC in highly desirable Splendora ISD. This home has brand new carpet throughout! New front and back porches! Upgraded stainless steel appliances PLUS refrigerator INCLUDED! Spacious family room open to kitchen that features breakfast bar, dark cabinets, walk in pantry and plenty of storage. Split floor plan. 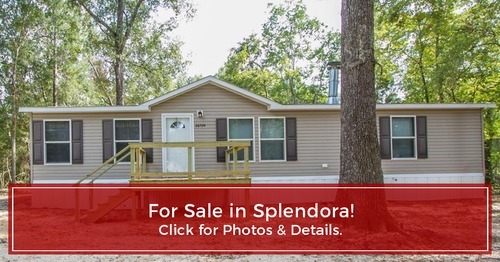 Master is spacious with large walk in closet; master bath provides double sinks, oversized shower and soaking tub; secondary bedrooms are nice size both with walk in closets. Utility room conveniently located just off the kitchen with direct access to back porch. Crushed concrete driveway. NO DEED RESTRICTIONS! Very nice lot with wood boundary around you – no back neighbors! High and dry. Public water and sewer. Seller offering home warranty. Plenty of room for growth, kids and pet friendly! Tons of opportunity – ability to build a shed, shop or garage!